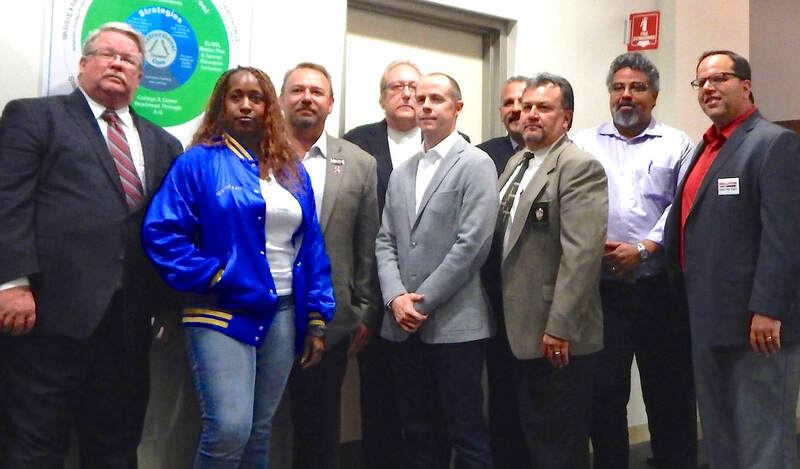 Leaders of the nine unions that represent teaches, administrators and other staffers at LAUSD stood before the district board today to express a united front against the Broad foundation plan to create more charter schools in the district. Flanked at the podium by the union leaders, Juan Flecha, president of Associated Administrators of Los Angeles (AALA), told the board, “All of us and our respective unions see this single passion for public education and commitment for the district.” He expressed disappointment that school board member Scott Schmerelson‘s proposal against the Broad plan had been postponed until January in deference to more time needed to continue the search for the new superintendent. Flecha said the union leaders stand in “support of the motion and it is important for the incoming superintendent to know where we stand, and we look forward to have the board pass it.” He added that he saluted Schmerelson’s braveness to bring the issue before the board. UTLA president Alex Caputo-Pearl, who represents the teachers, also said he was disappointed that the Schmerelson proposal was delayed and suggested that it would be beneficial for the new superintendent to hear the debate. He called for teachers to write the school board members directly about successful programs and projects at their schools, and come to the meeting today to tell their stories. “We don’t think the resolution had been a distraction; it would have provided a roadmap to the new superintendent.” he said. “We will remain resolute, we were disappointed about the delay.” He pointed out that they had a meeting with teachers yesterday to figure out how to highlight traditional public school’s successes. The appearance of the union leaders represented another challenge to the Broad-affiliated group now spearheading the charter expansion, Great Public Schools Now. They provided the board additional political cover to oppose the plan, as Schmerelson’s resolution seeks. UTLA, in particular, has been especially aggressive in fighting the plan, even though the board has limited legal authority to deny viable charter applications.